Hard start problems on a Lamborghini 400GT 2+2. This is a pretty car that is in great condition and doesn’t need any body or paint work. I just think it’s got a striking look. As far as I’m concerned Lamborghini styling never got better than this. This car is in the shop because of hard starting problems. The tech on this job performed an inspection and compression check and, given the good compression numbers, feels the car should perform better than it does. The older cars, more often than not, have problems with carburetor and distributor adjustments. After all, many technicians (previously known as mechanics) have never had to adjust a carburetor and have never even seen a set of ignition points. We will probably do a complete tune-up, set valve lash, adjust cam timing, put the distributors on the machine to make sure the advance curves are correct and adjust the carbs or possibly rebuild them. 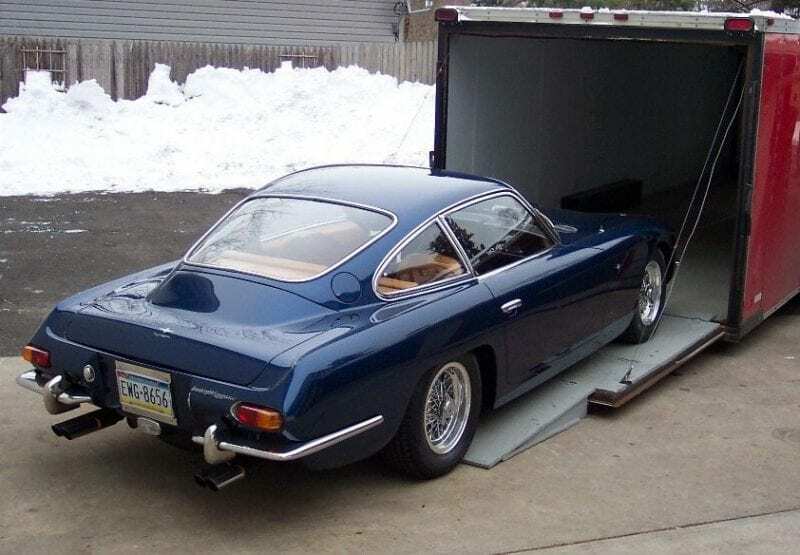 Beautiful Lamborghini 400GT 2+2 sold to Adam Carolla after a mechanical overhaul by Exoticars USA. Love the car Randy, and I should… It’s mine! Can’t wait to get it back.